Hi, my name is Olivia. I'm 6 years old, and sometimes I have questions about the world around us like: How do clouds make rain? Why is the sky blue? Why do the leaves turn different colors in the falls? Why do balls bounce? When that happens, I always go to see my friend, Dr. Heidi is real scientist and probably the smartest person in the whole world. She always knows the answers to my questions. She also knows how to do all kinds of fun, easy experiments that help me to really understand how things work. 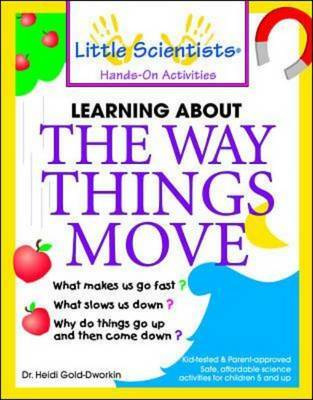 Today Dr. Heidi and I are exploring the mysterious forces that make things go fast, slow, up and down!Why not join in the fun as we find out the answers to all your hard questions about the way things move by making cool stuff like a macaroni go-cart, wax-paper skis, and a balloon-powered rocket. "The Little Scientists Hands-On Activities" series of books is an outgrowth of the nationally acclaimed Little Scientists educational program. Like the popular scientific enrichment classes for which they are named, these books are designed to expose kids, ages 5 to 8, to the thrill of scientific discovery, while helping them to develop core scientific skills of deserving, critical thinking, communication, classifying, comparing, applying and generalizing, measuring, predicting, hypothesizing, and problem solving.